Bedrock benches are visible near the top of an avalanche on the central peak of Langrenus crater (8.79°S, 61.22°W). LROC NAC M139504224L, downslope is to the lower left, image width is ~550 m [NASA/GSFC/Arizona State University]. Do these "stair steps" represent true rock layers that somehow survived the compression and uplift which accompanied the formation of this central peak, or are they expressions of jointing in the fractured bedrock? Many examples of lava flow layering have been identified within mare deposits across the Moon (see related Featured Image post links below), but these have been as exposures in crater walls or the sides of vertical pits within the mare. Rock layering in a central peak may be more difficult to see. 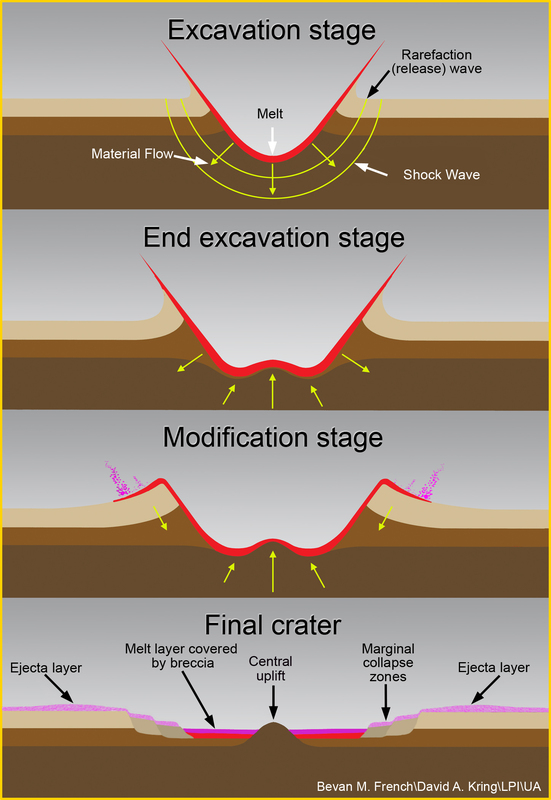 The physics of impact cratering describes the way a rock may respond to high-energy shockwave formation and decay. The central peak of a complex crater represents material that had once been deep beneath the lunar surface, but was later exposed by the rebound that followed compression during the impact event. The phenomenon of central peak formation in rock targets is often likened to the way a droplet of liquid creates a splash in a saucer. It represents a kind of snapshot of the splash phenomenon that results from impact into a target with an appreciable gravity field. While considerable deformation of target layers is expected, vestiges of that layering can survive impact and become preserved in the central peak. The features in today's image are exposed by erosion caused by landslide activity, and reveal the bedrock that once lay underneath (see context image below). The wider NAC view shows the granular material which flowed down (toward the lower left) the central peak wall away from the featured bedrock in Langrenus crater. LROC NAC M139504224L, image width is ~2.3 km [NASA/GSFC/Arizona State University]. On the Moon, rock jointing can be caused by tidal stresses working over time to weaken the rocks. Once jointed, the fragments are more easily eroded, and tend to break away in blocks - which may or may not give the appearance of true stratigraphic layering. Because the energy of impact is expected to at least partially destroy whatever fine structure might have been in pristine layers, it may be difficult to differentiate the two types of stair step benches in an outcrop. The WAC mosaic shows the central peak and Langrenus crater, with the Featured Image location indicated as the red square. The WAC mosaic context image shows Langrenus crater in all its glory, image width is ~180 km [NASA/GSFC/Arizona State University]. Take a look at the full NAC image. There are many details visible in the Langrenus crater floor deposits that warrant further scrutiny. What other clues might aid in determining whether this apparent laying is the result of lava flows or of rock jointing? Related Featured Image posts include Layering in Euler Crater, Layering in Messier A, and Rock Avalanche in Robinson Crater. Posted by James Ashley on October 06, 2011 09:00 UTC.